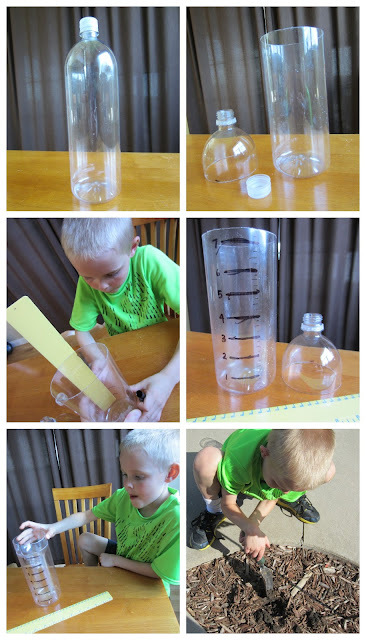 If you're on Pinterest, you've seen this amazing rain gauge project. The simplicity, short material list, and learning opportunity have made it a favorite among kids and parents for years - my son and I included. To make it you'll need a clear plastic bottle (like a 2-liter soda bottle) or a large water bottle. We used a Smart Water bottle. Remove the label. 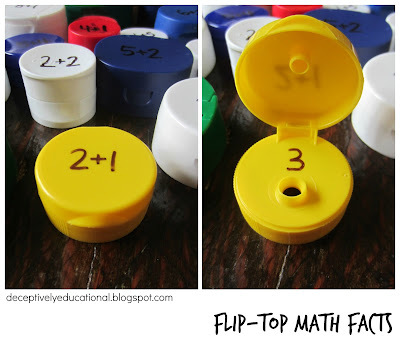 Have a ruler, scissors, and a permanent fine-tip marker handy. Cut the top of the bottle off with a knife or scissors; young children should leave this up to grown-ups to do. Now align a ruler so the end of the ruler is at the bottom of the bottle and make small marks with the marker up the side of the bottle where the inches or centimeter lines are. Now take the top of the bottle and place the spout upside down inside the bottle. With a little pressure, it will fit snugly. Head outside and find the ideal spot to place your rain gauge (away from trees, etc.). Dig a shallow hole and secure the bottle inside it. When it does, though, he'll be ready with this Daily Rain Record. Each day, he'll plot the amount our rain gauge catches by drawing a dot on the line. Then he'll check all the boxes that apply to the type of rainfall (e.g. mist, downpour, shower). 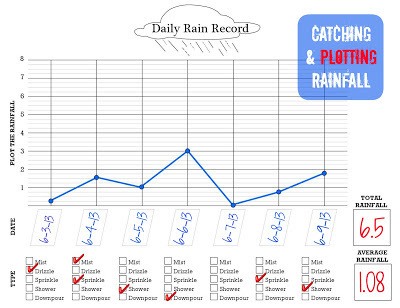 Download a PDF of this Daily Rain Record free here. When he has seven days of data, he'll draw lines between the dots, total the rainfall, and find the average by dividing the total by seven. You didn't think I was just going to make this a science lesson did you? (he he) I just had to sneak a little math in. Looking for a great book to read to pair with this activity? We read Elizabeth Miles' Watching the Weather: Rain. It covered why we need rain, helped us review the water cycle, and explained drought, floods, and acid rain - all in terms a soon-to-be third grader could understand. Going to share this one with my son's teacher who is looping to 3rd with her class from last year! This is fabulous!! I had to laugh when you said making this chased away the rain--it hasn't rained here for almost a whole week...maybe if we make one it can call the rain back, lol! Thanks so much for sharing this at Teach Me Tuesday at Preschool Powol Packets!! Relentlessly Fun, Deceptively Educational blog content may not be republished elsewhere without express written permission from the blog owner. Free printables are for your use at home and in the classroom, NOT for resale. If you have questions regarding this policy, contact deceptivelyeducational (at) gmail.com. If you are a teacher and need to request access to my printables through Google Drive, use your personal email address. In many cases, your school blocks emails coming from outside their domain, thereby prohibiting me from granting you access and notifying you via email. Dragonfly Craft Template -Easy Paper Craft for Kids!